Bill Avera was a lifelong educator of Berrien county who lived in the vicinity of Ray City, GA. He was born August 1, 1855, in Clinch County Georgia. His father was Stephen Willis Avera and his mother was Martha Elizabeth Aikins. William Green Avera was the oldest of eleven children, his brothers and sisters being Winnie Ann, Polly Ann, Sarah O’Neal, Daniel M., Lyman H., Phebe V., Lou, Junius H., Cordelia and Martha. Upon the organization of Berrien County, Stephen and Martha Avera brought their young son to establish the family homestead in the new county in 1856. During the Civil War, Bill’s father enlisted and became a soldier of Company E of the Fifty-fourth Georgia Infantry. Stephen Avera saw action defending Atlanta from Sherman’s approach and later in the battles at Jonesboro, Franklin, Murfreesboro and Nashville. The war ended while he was at home in Berrien County on detached duty. After the war, Bill’s father continued to farm in Berrien County. 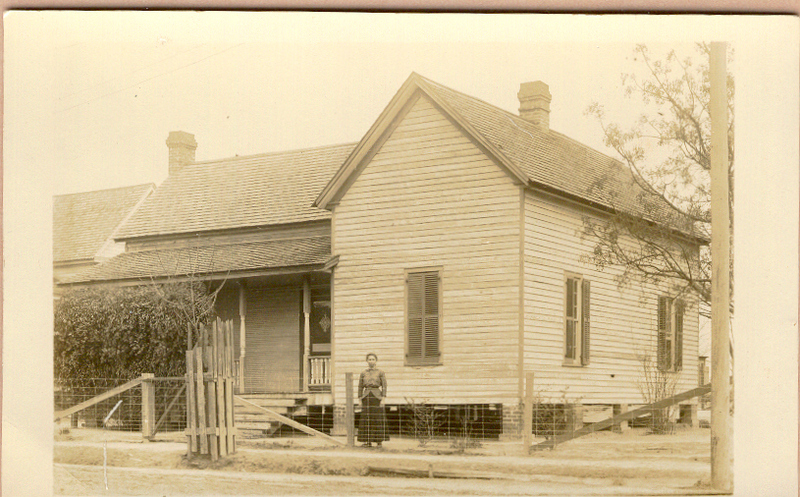 In 1877 Bill Avera married and established a household of his own near Ray City, GA. The home of William Green Avera was located about five miles northeast of Ray City, GA.
PROF. WILLIAM GREEN AVERA. The career of a man who for the greater part of a life time has been identified with the training and education of the youth is always one of the most valuable assets of a community. Probably no educator in south Georgia has been so long or so closely connected with educational progress and the practical work of the schools as the present superintendent of the Berrien county schools, Prof. William Green Avera. 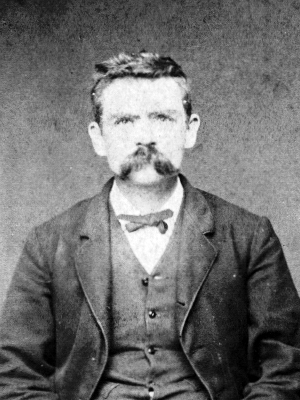 He belongs to a family of pioneer Georgians, and was born on a farm in Clinch county, the 1st of August, 1855. Reared in a good home and trained to habits of industry, William G. Avera early manifested special inclination for study and the pursuit of knowledge, and made the best of his early opportunities of schooling. He has been a lifelong student, and when he was eighteen he was entrusted with his first school, located three miles east of Nashville. For thirty-three years, an entire generation, he was in the active work of the schoolroom, and he taught children and children’s children during that time. The aggregate length of his service out of those thirty-three years was twenty-five full years, a third of a long lifetime. In 1907 professor Avera was elected superintendent of the Berrien county schools, and by re-elections has since served continuously in that office. His administration has been marked by many improvements in the county educational system. In 1877 Professor Avera was united in marriage with Miss Eliza J. Sirmans. Mrs. Avera was born in Berrien county, daughter of Abner and Frances (Sutton) Sirmans. She died at Sparks in 1905. In 1911 Professor Avera married Margaret McMillan, a native of Berrien county and daughter of Randall McMillan. The following children were born to Professor Avera by his first marriage, namely: Sirman W., Marcus D., Bryant F., Aaron G., Alice J., Homer C., Abner J., Willis M., Lona, and Lula. Marcus D., Homer C., Abner J., and Lula are now deceased. Aaron G. married Fannie Key, now deceased, and has one son, William. Sirman W. married Annie Young and has a daughter named Georgia. Bryant F. married Mary Patton. Alice J. is the wife of William T. Parr, and has four children, J. W.,Stella, Saren and Gladys. Lona married Austin Avera, son of I. C. Avera, sheriff of Berrien county. In 1878 Professor Avera settled on a farm eight miles southeast of Nashville, and that was the home of his family until 1904, when it was temporarily removed to Sparks that the children might have the benefit of the superior educational advantages available in the Sparks Collegiate institute there. Prof. Avera’s present home is at Nashville, the county seat of Berrien county. He still owns the old home where all of his children were born and reared, and where his beloved deceased wife and children are buried. Sacred is the memory of this home to the man who has given the best years of his life to the educational and moral upbuilding of this section of Georgia. Professor Avera and wife are members of the Primitive Baptist church, and in politics he is a Democrat. As a young man, William James Guthrie lived in the area of Lowndes county that would be cut into Berrien County in 1856, and later into Lanier County. Many of the Guthrie family connection still live in Ray City and Berrien County, Georgia. By 1860 William Guthrie had moved his family to Clinch County, where in 1862 he joined the Clinch Volunteers, Company G, 50th Georgia Infantry Regiment. His brother, Samuel Guthrie, joined the 54th Georgia Regiment. 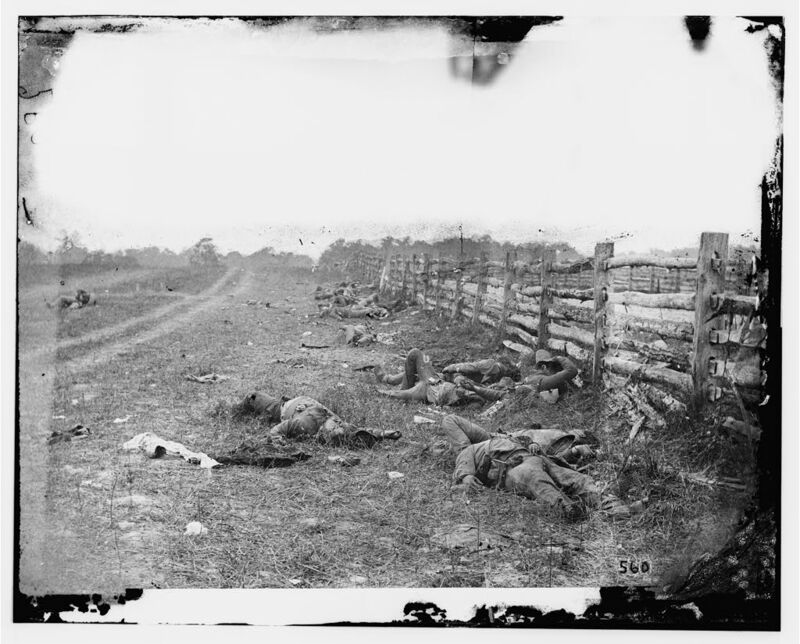 In the fall of 1862, the 50th Georgia Regiment suffered horrific casualties in the Maryland Campaign. William Guthrie was killed September 14, 1862 at South Mountain near Boonesboro, Maryland. That was the day on which the 50th Georgia Infantry Regiment, and the rest of Drayton’s Brigade, was slaughtered at Fox’s Gap in the Battle of South Mountain. The 50th GA Regiment suffered a casualty rate of 86% that bloody day, with 194 killed or wounded out of an effective force of about 225 men. In Company I, the Berrien Light Infantry, Mathew Hendley and Elisha B. Herring were among those killed; Richard P. Connell was mortally wounded; William Hartley and James H. Tison were missing in action; Lewis Marshall and Lemuel Gaskins were wounded and captured; Randall McMillan was wounded. Antietam bridge, looking across stream. Sept. 1862. Afterwards known as Burnside’s Bridge. Gardner, Alexander, 1821-1882, photographer. On the morning of September 17, 1862, this bridge was defended by the 2nd and 20th Georgia of Toombs’ Brigade and the 50th Georgia of Drayton’s Brigade. The 20th Georgia was on the high wooded bluff immediately opposite this end of the bridge; and the 2nd and 50th Georgia in open order, supported by one Company of Jenkins’ S.C. Brigade, continued the line to Snavely’s Ford. One Company of the 20th Georgia was was on the narrow wooded strip north of this point between the creek and the Sharpsburg Road. Richardson’s Battery of the Washington Artillery was posted on the high ground about 500 yards northwest and Eubank’s (Va.) Battery on the bluff north of and overlooking the bridge. The Artillery on Cemetery Hill commanded the bridge and the road to Sharpsburg. At 9 A.M. Crooks Brigade of the Ninth Corps, moving from the ridge northeast of the bridge, attempted to cross it but failed. 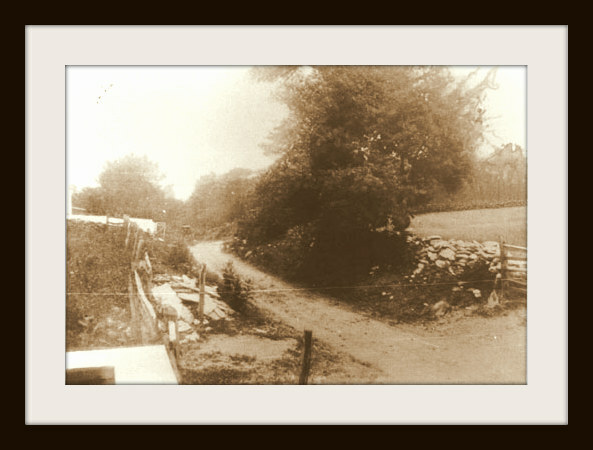 Soon after, the 2nd Maryland and 6th New Hampshire, of Nagle’s Brigade, charging by the road from the south were repulsed. 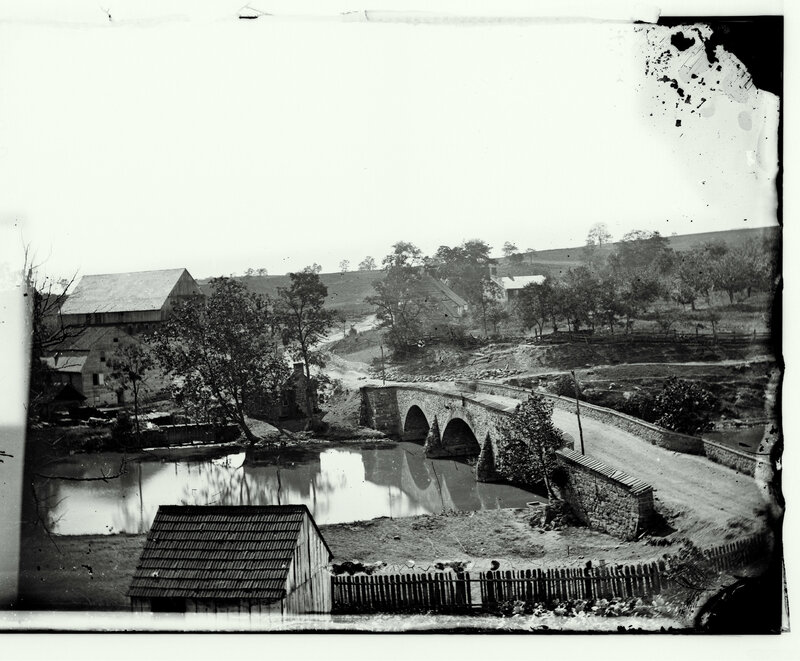 At 1 P.M. the bridge was carried by an assault of Ferrero’s Brigade and the defenders, after a vain effort to check Rodman’s Division, moving by Snavely’s Ford on their right flank, fell back to the Antietam Furnace Road and reformed on the outskirts of the town of Sharpsburg.